Students will use primary sources to examine the past. Students will be able to analyze multiple resources to explain the contacts between the American Indians and the European settlers during the Age of Discovery. 1. Display the painting John Smith Trading with Native Americans. Describe the landscape in the painting. Describe the individuals and their clothing and materials they used. Imagine you were the artist of this painting, what types of discussions may you hear? Give three adjectives on how the artist portrayed the North American Indians in this painting? Give three adjectives on how the artist portrayed the European settlers in this painting? What do you think was the painter’s purpose for creating this painting? Why do you think this? 3. Read the background information to illustrate the state of affairs between the North American Indians and the European settlers in the Jamestown area during the Age of Discovery. 4. Explain to the students the historical significance of Sir William Berkeley and discuss why a document written by him might be a good indication of the feelings at that time. 5. Organize the students into groups with four or five students in each. 6. Once in a group, the students should read "A Discourse and View of Virginia" by Sir William Berkeley, 1663. The reading begins below the heading Thomas R. Stewart and continues to the bottom of the page. 7. After reading the selection, the students should discuss the answers to the discussion questions while having a recorder write down the consensus answer. 8. Once the groups have had sufficient time to discuss the questions, come together as a whole class and have a class discussion on what the students came up with in their separate groups. 9. Students should then search through the paintings in the Sidney King Drawings in the Colonial National Historical Park Collections #1-24 and complete the student worksheet for at least five of the paintings. 10. Discuss the interpretations of the paintings according to how the students interpreted them. 1. Display John Smith Trading with Native Americans. 2. 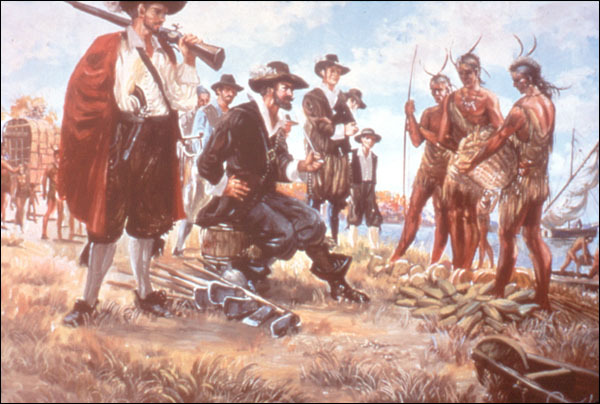 Ask the students to revisit the painting and write a short essay on their thoughts about this painting, thinking especially of the contacts between the American Indians and the European settlers during the Age of Discovery and decided if this is an accurate portrayal of what may have occurred during this time. Axtell, James. Beyond 1492: Encounters in Colonial North America New York: Oxford University Press, 1992. Fausz, J. Frederick. "Indians, Colonialism, and the Conquest of Cant: A Review Essay on Anglo-Indian Relations in the Chesapeake," The Virginia Magazine of History and Biography, Vol. 25 No. 2 (April, 1987): 132-156. Merrell, James H. "'The Customes of Our Country': Indians and Colonists in Early America," in Bernard Bailyn and Philip D. Morgan, eds., Strangers within the Realm: Cultural Margins of the First British Empire. Chapel Hill: University of North Carolina Press, 1991. Standard 11.1d: "The student will analyze and explain the contacts between American Indians and European settlers during the Age of Discovery, in terms of: legacies of contact, cooperation, and conflict from that period." This module created by Scott Waring, University of Virginia.